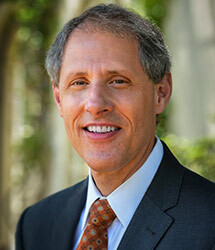 On July 1, 2014, Thomas F. Rosenbaum took office as Caltech’s ninth president. Rosenbaum was formerly the John T. Wilson Distinguished Service Professor of Physics at the University of Chicago, where he served as the University’s provost for seven years. As Chicago’s provost, he had responsibility for a broad range of institutions and intellectual endeavors across the sciences, arts, and professional schools. He has been deeply engaged with Argonne National Laboratory as the University’s vice president for research and for Argonne National Laboratory from 2002 to 2006 and as a member of its Board of Governors. Rosenbaum is an expert on the quantum mechanical nature of materials—the physics of electronic, magnetic, and optical materials at the atomic level—that are best observed at temperatures near absolute zero. He conducted research at Bell Laboratories and at IBM Watson Research Center before joining the University of Chicago faculty. Rosenbaum is an elected fellow of the American Physical Society, the American Association for the Advancement of Science, and the American Academy of Arts and Sciences. Rosenbaum received his bachelor’s degree in physics with honors from Harvard University and an MA and PhD in physics from Princeton University.